This is a brief history of the strange relationship between the USA and Cuba. It defies logic. Originally, Cuba was a colony of Spain. In 1898, the Cubans rebelled and welcomed the help of the Americans. The Americans successfully expelled the Spanish, then turned Cuba into a quasi-colony. Cuba was not allowed to make treaties with any country other than the USA. American citizens were given special privilege to take over Cuban land and resources. Cuba became a haven of organised crime who offered elaborate hotels, entertainment, casinos, prostitution and other vices illegal in the nearby USA. Then in 1959, there was another rebellion to kick out the puppet dictator Batista. Fidel Castro became the new dictator. Oddly, America celebrated by issuing a postage stamp in his honour. I remember collecting it as a boy. To the horror of the Americans, Castro formed an alliance with Soviet Russia. The Russians bought lots of sugar and provided the Cubans with machinery, fertiliser etc. On 1961-04-17, the CIA (Central Intelligence Agency) mounted an unsuccessful invasion of Cuba at the Bay of Pigs. The Americans set up ICBMs (Inter Continental Ballistic Missiles) in Turkey ready for instant attack on the Soviet Union. The Soviet Union retaliated by setting up ICBMs in Cuba ready for instant attack on the USA. 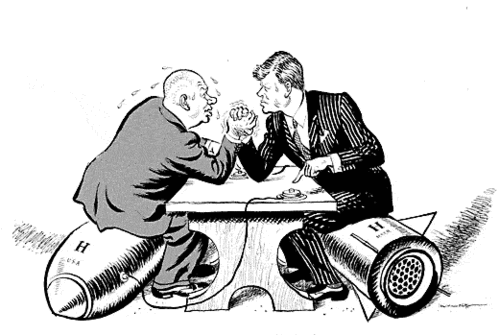 John F. Kennedy blockaded Cuba with a ring of warships and nuclear submarines and threatened nuclear war. I remember the day — 1962-10-28. I did not do my homework because I was so sure I would die that night. Everyone felt nuclear war was inevitable. I was furious with Kennedy. I figured the obvious way out of the impasse was to withdraw the missiles from both Turkey and Cuba. He would have none of it. He wanted everything his own way with the Russians getting nothing. Vasili Alexandrovich Arkhipov, a Russian nuclear sub captain, refused an order to fire a nuclear torpedo during this cowboy testosterone-fueled confrontation. That is why I am still here to write this essay. The United States then decided to destroy Cuba by economic strangulation. They forbade any trade between the USA and Cuba and punished with crippling fines international companies with offices in the USA who did trades with Cubans of $1000 or more in any currency anywhere in the world. The Soviet Union kept Cuba financially afloat until it broke up. Venezuela also traded with Cuba in defiance of the USA. This embargo caused extreme privation. Cubans were denied food, tractors, medicines, vaccines, medical equipment… They had to learn to make everything themselves, or figure out how to keep old equipment running indefinitely. The hundreds of assassination attempts on Fidel Castro are a legend, mostly for their James Bondian silliness. Perhaps more important is the reckless regard for civilians. The Americans killed 300 bystanders in one attempt and just about killed a room full of school children in another. By that definition there were 700 documented acts of terrorism on Cuban citizens by American citizens, killing 3400. Exactly who is responsible is fuzzy. Sometimes the CIA ordered or instigated the attacks. Sometimes the US military did. Sometimes terrorist groups of Cuban expatriates were responsible, funded by the CIA, or given a blind eye. One of the attacks that is most reprehensible was the torture and death of 12 teachers whose crime was teaching literacy, hence aiding the Cuban revolution of 1959. Another particularly execrable one was a bioterror attack causing 300,000 cases of the most lethal strain of dengue fever. Another particularly sick one was a Operation Peter Pan that took 14,000 children away to the USA, never to see their parents again. Over the years the control of the terrorism flowed from the US military to the CIA to the Florida counter revolutionary terrorist groups. 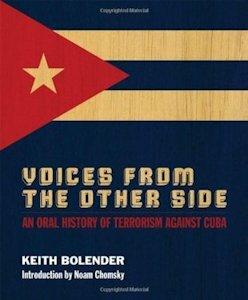 Bolender is a Canadian journalist who first went to Cuba to arrange amateur sports events. He became interested in the American terrorist attacks on the Cubans and decided to document the experiences of ordinary citizens. I went to a lecture of his and got to ask him many questions. One clue is the law forbidding American citizens to visit Cuba. The government does not want ordinary citizens going to Cuba and finding out what it is really like there. My mom, a Canadian, went in the early 1970s, when such travel was still considered naughty. She had a blast and came back and reported Cubans were extremely happy people and quite content with their government. The US government does not want Americans coming to a similar conclusion. Why? The Cubans are one of the few people experimenting with an economic system other than vulture capitalism. Given the circumstances of the USA sitting on them trying to crush them, they are doing remarkably well. They have better IMR (Infant Mortality Rate) than the USA. The American capitalists don’t want a good example of any alternative economic system showing them up. American politicians tell lies about Canadian health care for the same reason. There is another motive. In 1959, wealthy families fled Cuba for Florida. They left much of their wealth behind and the Castro government nationalised much of it. Since the wealthy families and the extremely wealthy crime families were forced out of Cuba, as you might expect, to this day, they are highly resentful. They don’t consider the government in Cuba legitimate. They want the USA to retake its pseudo-colony and put things the way the were back in 1959. They support/buy politicians like Republican Marco Rubio, Democrat Debbie Wasserman Schultz and Democrat Howard Berman to fight for their cause. They also hire mercenaries to mount terrorist attacks on Cuba and assassination attacks on Castro. Defending themselves against these attacks has been costly for the Cubans both in money and civil liberties. The ex-patriates are getting old and their children are not as rabidly dedicated to restoring the old order. The rest of America is about as interested in Cuba as they are in Antarctica, so this small but wealthy group prevails in national policy. Castro is a dictator in a one-party state. It is an embarrassment having one right on America’s doorstep. On the other hand, dictators like Fidel Castro and Hugo Chavez enjoy approval numbers a democratic politician would kill for so they are not dictators of the magnitude of Saddam. Castro has provided a medical system that pulls off an IMR than ties with the USA. The CIA says so. He is a relatively benevolent dictator, though certainly no saint. It is embarrassing for the USA that despite putting so much effort into squashing Cuba, it refuses to squash. Many still think of it as an American colony that should do as it is told, like Puerto Rico. Cuba is an embarrassment to American military prestige. If America were to normalise relations with Cuba, it would look like defeat by a tiny foe. Happily, terrorism attacks have been much less frequent in the last decade. The folks who are willing to kill children for restored privilege are getting old. Their hormones are mellowing. The new generation of Cuban-Americans left Cuba more for economic opportunity rather than to flee Castro. They have family in Cuba. They want normal relations. 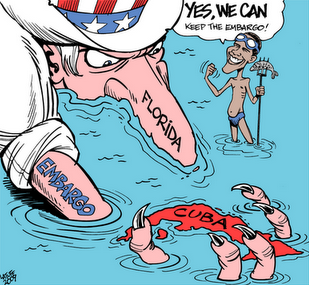 Unfortunately, it is up to the Republican congress to pass a law to end the embargo. The Republicans are firmly in the pro-embargo camp. However, the Democratic president Obama has the power to licence various sorts of tourism and trade exemptions, to the point, he could, single handedly, for all practical purposes, end the embargo. However, as you might have guessed from the cartoon at the top of this page, Obama has shown no sign of being willing to use this power. In fact, Obama reneged on his promise to end the embargo if Cuba released political prisoners. It looks like Cuba may have some plump oil reserves. Practical economics may eventually force the USA to swallow its pride and lift the embargo so it can buy the oil it needs. Each year, there is a vote in the UN (United Nations) to end the embargo. All the countries in the world vote for ending the embargo except for the USA, Israel and the Solomon Islands. Since the USA has a veto, the motion is defeated. The USA pays Cuba $5000 a year rent for the Guantánamo naval base. Mr. Castro does not cash the cheques and has asked the USA to leave. They refuse. Castro has no means to force them to evacuate. It is one of the best harbours in the Caribbean so it is likely to remain in American hands in the foreseeable future.